Restore the people and creatures of Shattered Grove. Shattered Grove — Solve the mystery of the silent village of Shattered Grove. Merormo senses that a powerful Daedra has wrested control of the animals. As long as the Daedra remains, Merormo won't free the villagers. Find Merormo in the village. After watching the failed banishing ritual in Silent Village, Merormo will inform you that there is a powerful Daedra nearby. He thinks it dwells in a cave to the north of his tower and he wants you to dispatch it. Be careful when heading to the cave, as more and more animals appear the closer you get to it. When you do reach it, you find a Flame Atronach at the entrance, and a wounded Anenwen. Anenwen warns you that the cave is full of Daedra, and reveals that the daedric possession of the beasts was caused by Merormo, who was attempting to create an army. Apparently what's actually controlling the daedra is at the bottom of the cave. The cave is populated by a few Flame Atronachs, and at the bottom of the cave you will find the daedra leader. Defeat him and return to Anenwen, who now appears to have recovered from her wounds and wants your help to confront Merormo who is back at the village. When you reach him, Anenwen will force Merormo to restore the villagers and then captures him to prevent him from teleporting away. When you talk to him, he'll beg you not to tell the Canonreeve, saying that he'll be executed. When asked why he turned the animals into daedra, he says that his nephew was killed in a war and he wanted an alternative to sending young soldiers to their deaths. 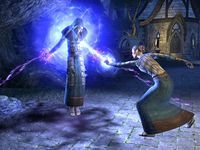 When you talk to the Canonreeve, she'll be confused and ask you what happened, and you can either tell her that Meroromo caused all the problems, or that he turned everyone to stone to protect them from the daedra. If you lie to her, then speak to Merormo for your reward. I need to find the cave where the Daedra is hiding. Outside the cave, I found a wounded woman near the body of a dead mage. I should speak to her. I learned that Merormo is responsible for unleashing the Daedra on the local wildlife. I need to enter the cave and kill the Daedric leader that resides there. I killed the monster. I should speak to Anenwen again. Now that the Daedric leader is dead, the animals should return to normal. I need to confront Merormo back in town about Anenwen's accusations. I should watch and listen as Anenwen confronts Merormo about what happened here. When Anenwen spoke to Merormo, he claimed his intentions were noble. I should speak to Canonreeve Pinanande. Perhaps I can influence what will happen to the misguided mage. I spoke to Canonreeve Pinanande and told her that Merormo was just trying to help. I should speak to him for my reward. This page was last modified on 18 April 2019, at 15:06.